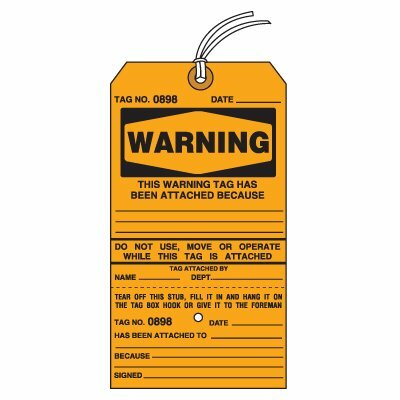 Tag reads "This Warning Tag Has Been Attached Because"
TAG NO. DATE_____. THIS WARNING TAG HAS BEEN ATTACHED BECAUSE _____. DO NOT USE, MOVE OR OPERATE WHILE THIS TAG IS ATTACHED. TAG ATTACHED BY. NAME_____. DEPT._____. TEAR OFF THIS STUB, FILL IT IN AND HANG IT ON THE TAB BOX HOOK OR GIVE IT TO THE FOREMAN. TAG NO. DATE_____. HAS BEEN ATTACHED TO_____. BECAUSE_____. SIGNED_____.